My previous two posts have been on the John E. Mitchell Company’s period as a full-time contract manufacturer of munitions and materiel for the Navy and Army. 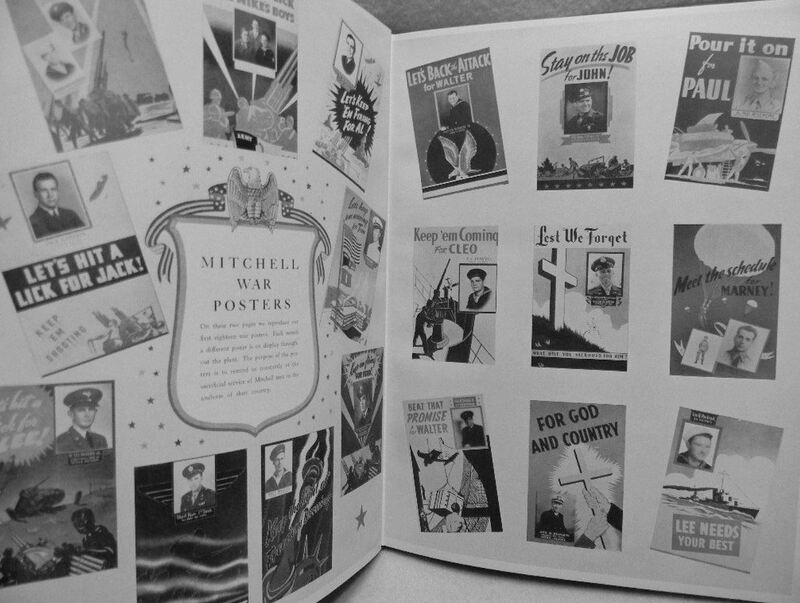 I had planned for my third Mitchell post to be about the building itself, but I just happened across this book — The Mitchell War Book — and I thought I would go ahead and slip this in now. I’ll write about the building next. 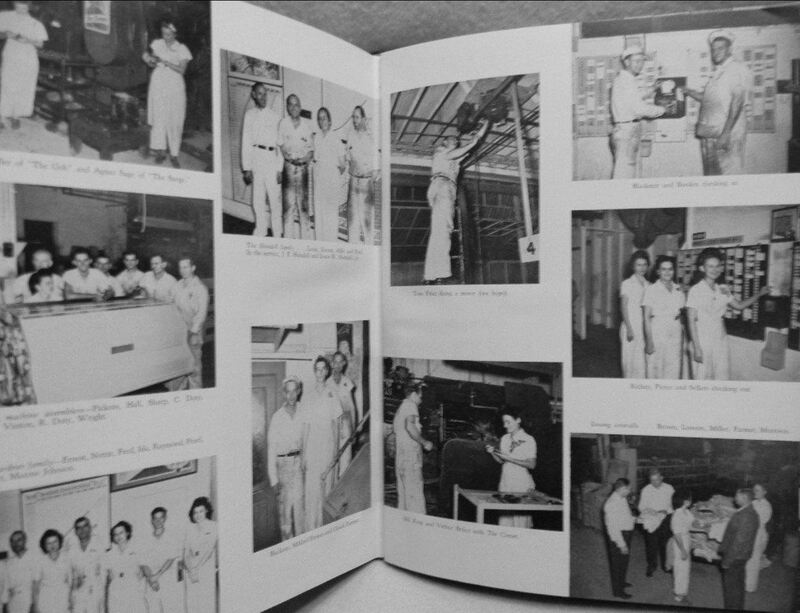 The book appears to be similar to a high school yearbook, with tons of photographs of Mitchell personnel at work on the factory floor and hanging out with their fellow war-workers in lighter off-duty moments. I’ve never seen this book (though I’d love to! 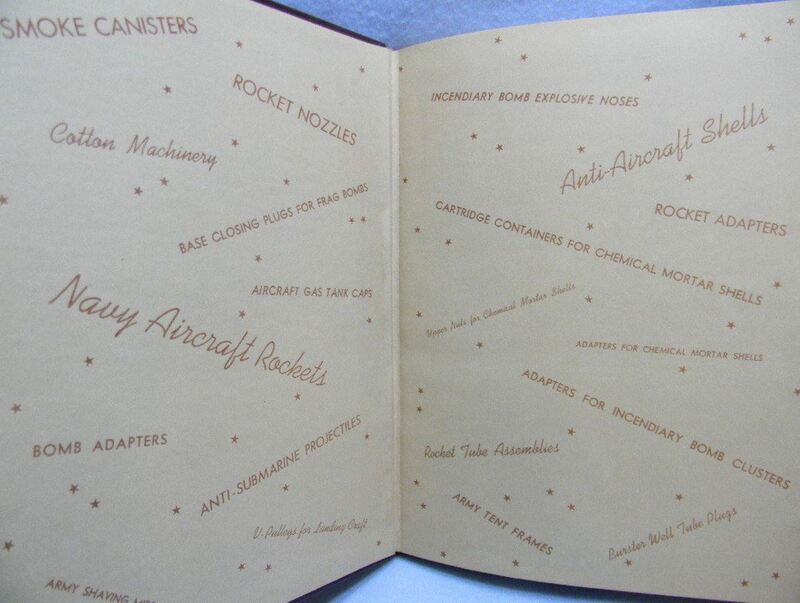 ), but it appears to be packed with pages and pages of photos. The posters above are interesting. When I posted a card the other day describing what this was all about (see it here), I didn’t fully understand. 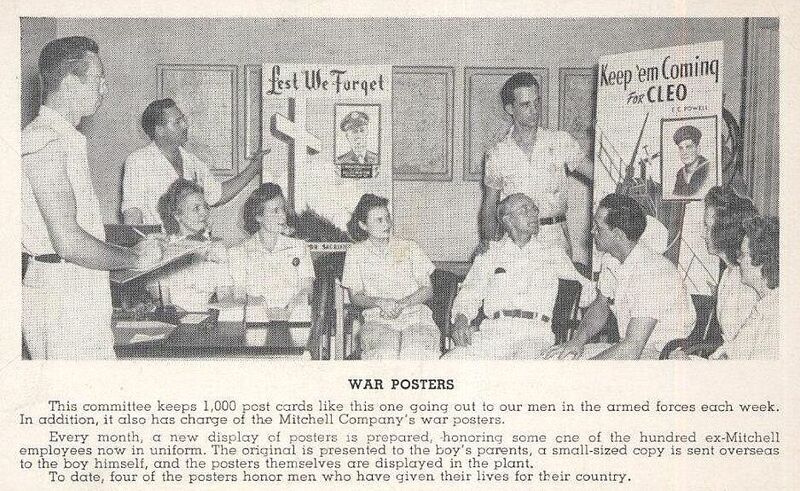 The company made these posters as reminders to the workers who they were working for: their fellow employees who were serving overseas. 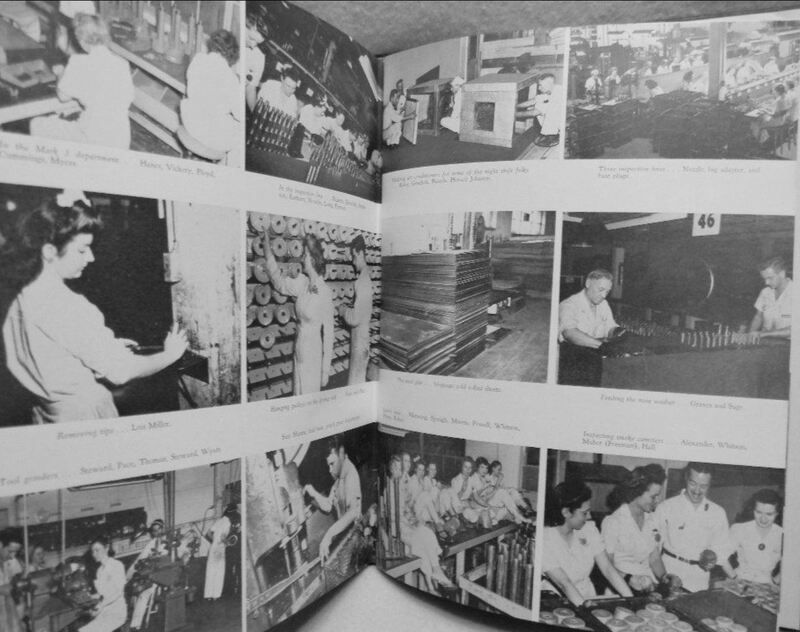 Above, the book’s endpapers show the various items the Mitchell Company was manufacturing for the U.S. Navy and U.S. Army. 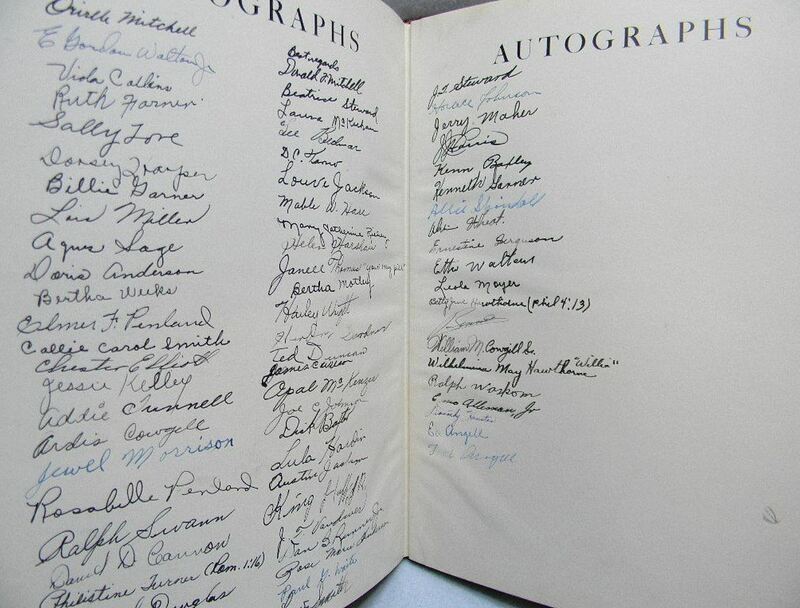 A few “autographs” of the John E. Mitchell Company’s wartime workers. Anyone you recognize? As mentioned above, these photographs are from a current eBay listing, here. Seems this book is pretty hard to find. I see only one other copy for sale — at about the same price — from a bookseller in Austin, here. If you’re unwilling to fork over a fistful of cash but still want to look through the book, then hie yourself to the downtown Dallas Public Library to browse through the 127 pages of their only (non-circulating) copy; bibliographic details on the book from the DPL site, here (or if you don’t have a DPL account, here). The two previous Flashback Dallas posts on the John E. Mitchell Company’s time as a munitions factory can be found here and here. 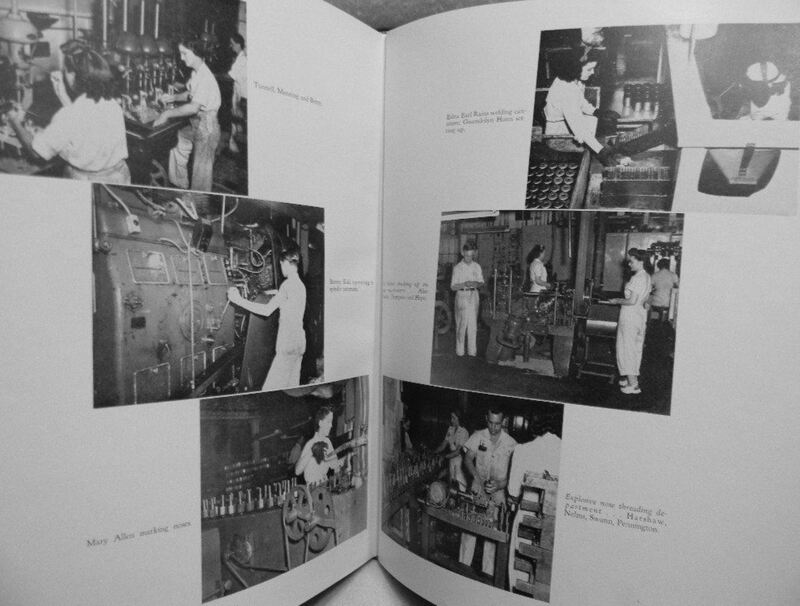 I started in 1960 and remember Steward, Maher, Garner, Cowgill, Don & my Engineering mentor Orville ( gave me his Machinist Handbook), Opal, Huff, skinney Penland who admired full women, ace machinist Swann and wife. Quit 1974 and worked auto A/C till 2010.